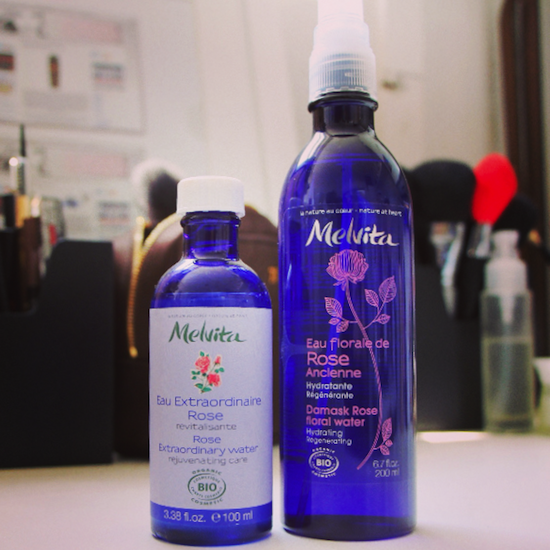 Melvita’s Damask Rose Floral Water, (right hand side of photograph), is not to be confused with Melvita’s Rose Extraordinary Water (left). One (the floral water) is a hydrating spritz that can be used over or under skincare and makeup to rejuvenate, freshen and cool. It’s distilled from Damask Rose petals and is very slightly astringent so great to use after cleansing if you don’t want to use a toner. (Gives you that slightly “tightened” feeling.) It’s £13 with free delivery from FeelUnique.com and makes a great hot weather cooler! The Eau Extraordinaire is something quite, quite different – I’m very enamoured with this stuff and always have a bottle lying about! The Extraordinary Water contains hyaluronic acid to help the skin lock in moisture, so rather than being just a “surface spritz” it’s more of a prep product or pre-moisturiser-moisturiser. A while back I discussed extra beauty steps (I think I was talking about the Wonder Essence from This Works?) and many of you professed a love of ritual and multi-staged beauty routines – this water would make an ideal pre-serum step if you fancied really going to town! It’s quite a strange old texture – like a very watery gel – but you simply swipe it on with cotton wool and leave. As well as the rose version there’s one with orange blossom – I’m hard pressed to tell you which one I prefer. You can get the Extraordinary Waters for £15.50, again with free delivery at FeelUnique.com. What do you think about products that bridge the gap between cleansing and moisturising? I quite like to help rebalance and tone the skin ready for serum or moisturiser, but I sometimes worry that I’ll be confusing my skin or using unnecessary steps. It’s not necessarily a time-restraint issue, because I spend ages testing new products anyway, more that I wonder how much difference certain steps can really make… Thoughts?